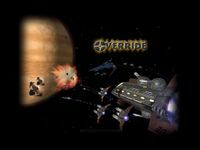 EV Override is Ambrosia's huge follow-up to the classic Escape Velocity. Much like the original game, you are cast as a pioneering space captain with only a small shuttlecraft, a bit of money, and a strong sense of destiny. But the similarity ends there. Override features a universe five times the size of the original game, and a slew of populated worlds within. Gone are the neverending wars which raged in the original game; instead, winning critical battles can change the face of the universe. Or, if you're happy with the existing balance of power, you can make a living as a humble trader. Just watch out for those pesky renegades, who want nothing more than to swipe the precious cargo from your holds.